← Born in Scotland and Died in Londonderry! The Johnston’s of Ardnableask & the Elvin’s of Cashelnavean, Co. Donegal! Jane Johnston – My 2nd Great Aunt or… Is She? 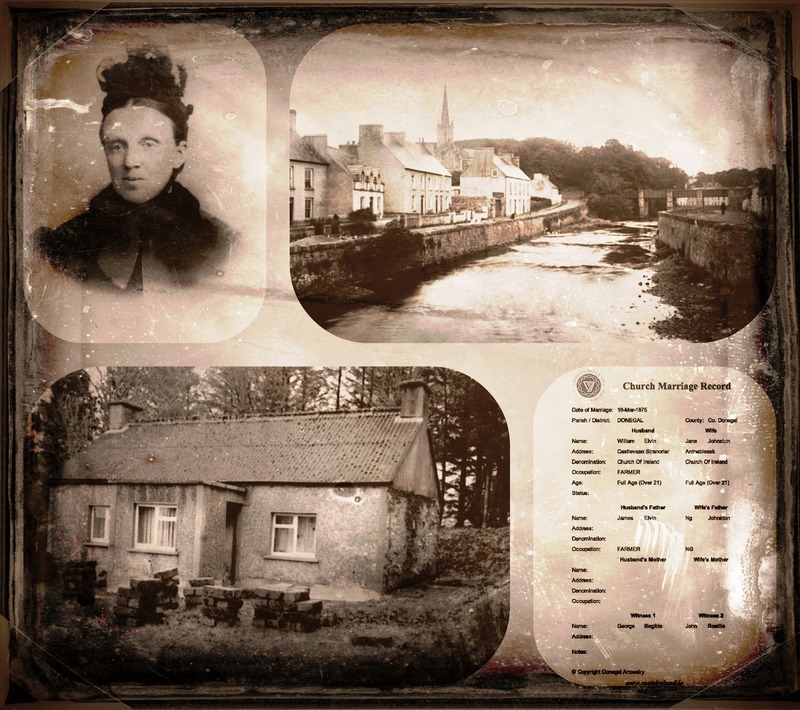 A daughter, sister, wife and mother – Jane Johnston was born about 1854 in Lough Eske, Co. Donegal. Jane is one of six children born to John Johnston and Isabella Smyth – OR is she! Her older “sister” Catherine is my 2nd great grandmother. Parish records reveal that Jane Johnston of Ardnableask married William Elvin of Castlenavean, Stranrolar on 16 Mar 1875 in the Donegal Church of Ireland. The Marriage Record shows that John Beattie and George, whose name is illegible; witnessed the couples union. William’s father was recorded as James Elvin; however, Jane’s father was recorded as “Johnston” his first name was not given! Jane and William’s married life began in Donegal, by 12 Mar 1876, and the birth of their first daughter, Mary Jane; they were living on the Lower Road in Londonderry. Records indicate they were living at the home of Jane’s sister and brother in law; John and Catherine Chambers. In 1879 and the birth of their second and third children (Elizabeth and John James) the family still resided on Lower Road; records confirming that the “occupier” was still John Chambers. It would seem, as many had during that period in time; the family had moved to Scotland in order for William to secure work. 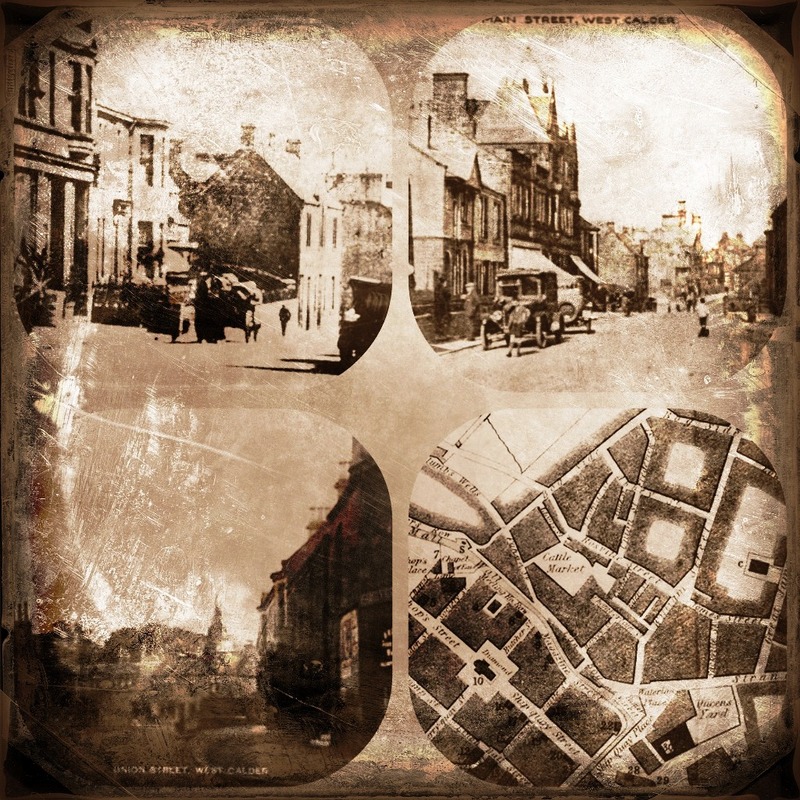 The 1881 Census of Scotland disclosed the family was living at 41 Close in the village of Calder, and William was working as a labourer in the iron works. In October of 1881, a few short months after the death of John James, Jane gave birth to their fourth daughter Isabella. Their family continued to grow with the birth of their second son, and fifth child; Joseph in June 1884. Once again the family suffered another death – sadly, Joseph too died in infancy in March 1886. Baptismal Records from St. Columb’s Cathedral, for their sixth child and fourth daughter – Margaret, dated 11 Nov 1888; confirm that once again the family had returned to Londonderry. At this point in time the family was living on Nailors Row with William working as a labourer. 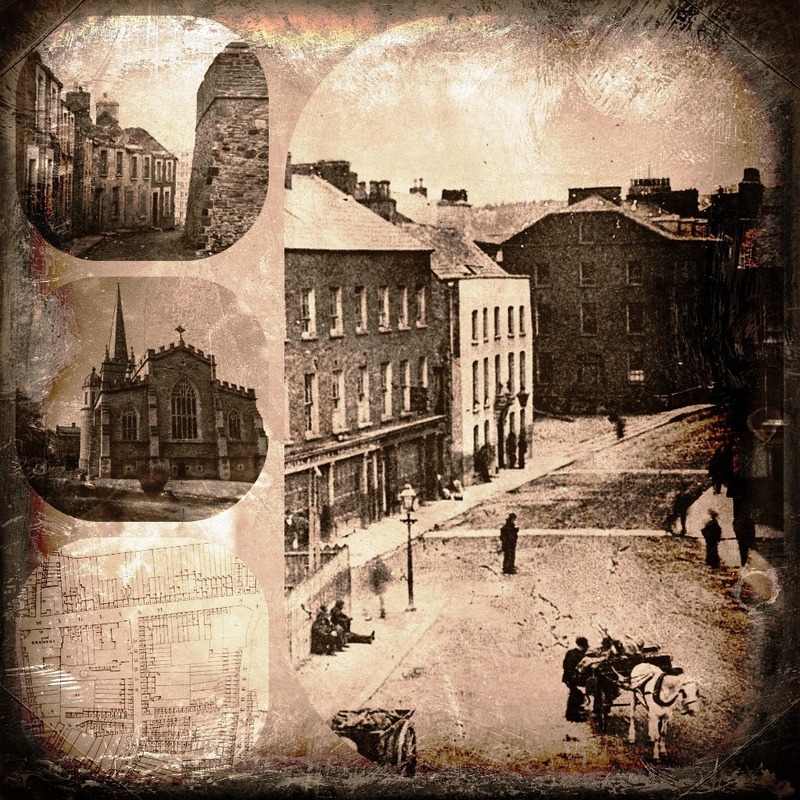 The family was complete in 1891 with the birth of their last child – another daughter named Catherine; she too was baptized at St. Columb’s Cathedral. On 27 Apr 1892 tragedy struck the Elvin family once again. William passed away at 113 William Street, Londonderry in the presence of his brother in law, John Chambers; with whom the family was still living. His death record indicates his cause of death was “disease of kidneys & albuminuria”. It would seem that the males in the particular line of the Elvin were not destined to live long lives. 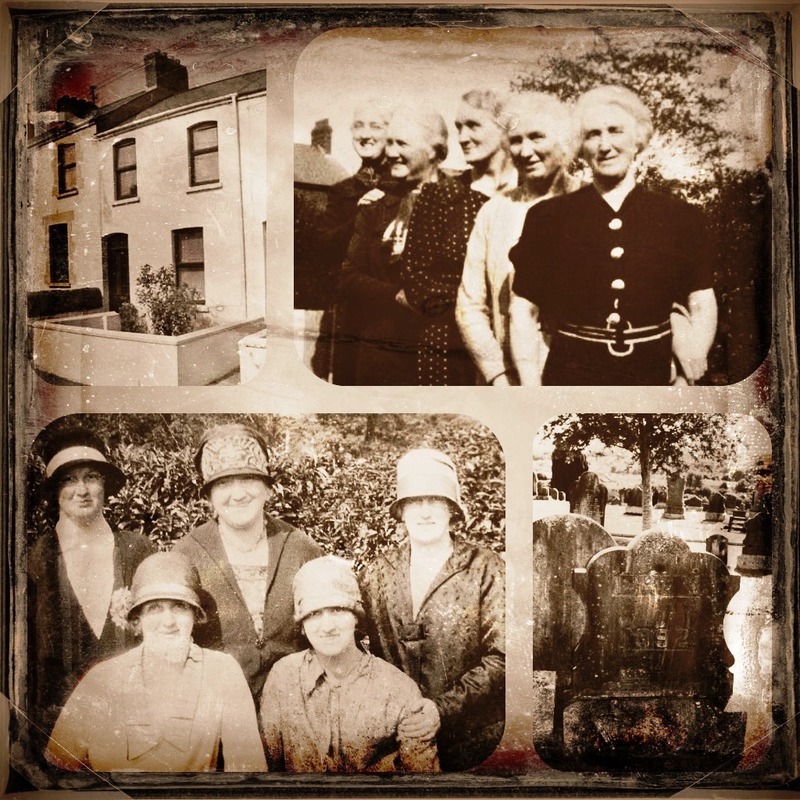 At the time the 1901 Census of Ireland was taken Jane and her daughters were living in 15 Argyle Terrace. An article in the Derry journal, published on 27 Mar 1903; entitled “Sales of House Property in the City” stated “Three new houses of six apartments each and scullery, situate Nos. 28, 30, and 32, Argyle-terrace, were purchased by Mrs. Jane Elvin, Mrs. Sherrard and Mr. Patrick Woods respectively at £200 each.” 28 Argyle Terrace is that home that Jane remained in until her death. On 15 Jun 1940 Jane passed away in her home on Argyle Terrace; her nephew Alexander Love (my great grandfather) of 47 Abercorn Road was present. Her death record noted her death was due to “a cerebral haemorrhage due to arterio sclerosis due to senility”. Jane, along with her husband William and daughter Isabella; is interred in the Derry City Cemetery. Some mystery surrounds Jane. Although I, and several distant cousins; have searched for her Birth and Baptism Records … none are to be found. Approximately fourteen years separate her assumed birth year and that of her closest sibling. Her father’s Christian name is not on her Marriage Record – which may or may not be relevant. Although I have acquired a lot of information on Jane, much more remains to be found on this particular Twisted Limb. “In the end, we’ll all become stories” Margaret Attwood. 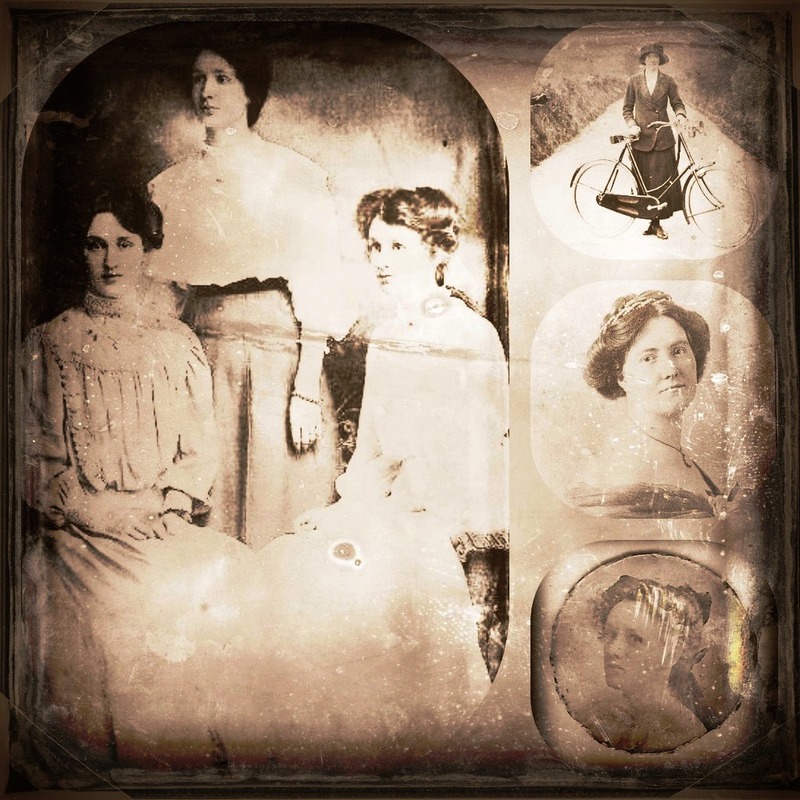 This entry was posted in Co. Donegal, Co. Londonderry, Family History, Geneaology, Ireland, Scotland and tagged Chambers Family, Co. Donegal, Co. Londonderry, Elvin Family, Family History, GeneaBlogger, Ireland, Johnston Family. Bookmark the permalink. 5 Responses to The Johnston’s of Ardnableask & the Elvin’s of Cashelnavean, Co. Donegal! I know some Elvins and where Johnstons were. Did I correspond with you before? I suspect that the Elvins house was in the middle of Barnesmore Gap and has been unoccupied for many years now but one of the descendents from there lives near Clar RC church outside Donegal Town. The Bustards house in Ardnableask was known in my young days as Adams and I have a friend whose grandmother was reared in that house. I remember the Bustards of Milltown, Maud and George, never married, brother and sister. I can’t place a Johnston family in Ardnableask, but there was a Johnston family in Ardevin between Ardnableask and Milltown I now own the almost 9 acres there, the house is long derelict. Adam Bustard was my grandfather’s brother. His daughter, Minnie was my mother’s matron of honour. Is there a house in Ardnableask still remaining or is it in ruins? Hello Sylvia, just seeing your reply to my earlier post. Minnie Bustard married a Duncan from Dromore near Mountcharles, Her granddaughter went to school with me, we shared a table for cookery and she is a multi-award winner for her baking but I remember showing her how to get started almost 60 years ago, Audrey is married to Jackie Irwin and lives in Gortloskey near Killymard R.C. Church outside Donegal Town in the parish of Killymard. They are both keen fundraisers for the RNLI. The house in Ardnableask is still standing but must be in poor condition by now as it hasn’t been lived in for almost 60 years. My mother was friendly with that lady in the gate lodge, she called her wee Kate and that house was restored some years ago. My son thinks it is a wonderful location as you could fish the lough from the back door. Solis Lough Eske Castle is now a 5 star hotel.